During our trip to Caineville this year, we took a day off from riding to hike the Horseshoe Canyon Trail in Canyonlands National Park. 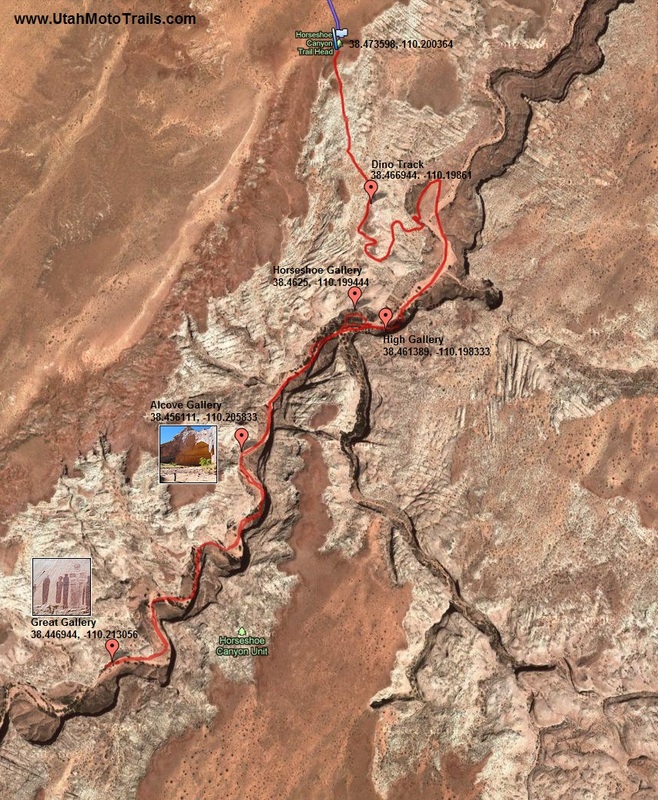 This trail is relatively close to Caineville as well as the San Rafael Swell and can be visited easily in conjunction with one of these two riding areas. The major highlight of this hike are the numerous Indian pictographs that can be seen along the hike. It has been said that the area known as "The Great Gallery" is likely the best display of pictographs in the world. To get there take take Exit #149 from I-70 to Highway 24. Follow Highway 24 south from I-70 for 25 miles to mile maker 135.5 (1/2 mile south of the turn-off to Goblin Valley State Park). Here there is a well maintained dirt road on the East side of Highway 24 (38.623333, -110.571111). It is easy to see and there is a large sign indicating the way. This area is criss-crossed with roads, but stay on the main road(suitable for passenger cars) and follow the signs and it's hard to get lost. 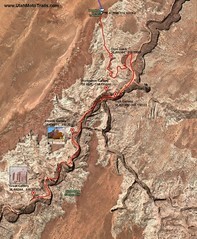 I've provided a map below of the route from Highway 24 as well as our hike through the canyon. For detailed google directions from your location click on the "directions" link to the trail head. Be aware however that while google may leave you over 2 hours to get to the trail head from highway 24 that it should only take an hour. There is a parking area at the trail head(38.473611, -110.200278) as well as an information kiosk. The day we hiked the trail we were lucky to have perfect weather. The hike in and out of the canyon is not shaded and can be brutal on a hot day. The entire hike is very scenic and it doesn't take too long to get to the first set of pictographs(the walk into the canyon looks longer than it is from the top). Click the camera icons on the map to see points of interest along with pictures of each point. We really enjoyed this hike for the most part, but our kids had a hard time staying entertained through the sandy wash that makes up a large part of the hike. 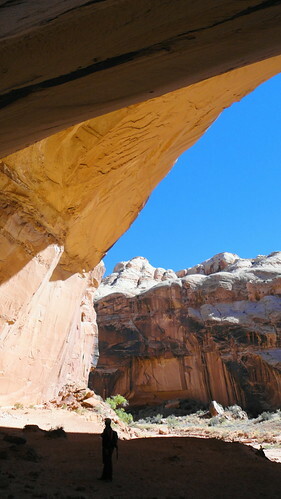 We've been on slot canyon hikes that seem to hold their interest better and make the hike go quicker for them. We really enjoyed the Alcove Gallery about midway through the hike. It is well shaded and an impressive spectacle. This makes a good snack break before heading on to the Great Gallery. The Great Gallery is where we ended our hike and turned around. The canyon surrounding this gallery are not as impressive as Alcove Gallery, but the pictographs are much more impressive. Also, I believe that this is the location that hiker Aron Ralston made contact with hikers after his ordeal in Blue John Canyon approx. 5 miles upstream. The movie 127 hours depicts his ordeal that is widely known. We stopped here for some time to take pictures and have some snacks. At the time we were there, they had a booklet describing the pictographs inside an ammo box as well as a pair of binoculars. click for Directions to the trail head from your location, see the map below for route information beyond that. This trail can be hiked at any time during the year, although it does get hot in the summer so spring and fall are best. It was just right the day we hiked it in mid October. There is shade in the wash and occasional standing water. 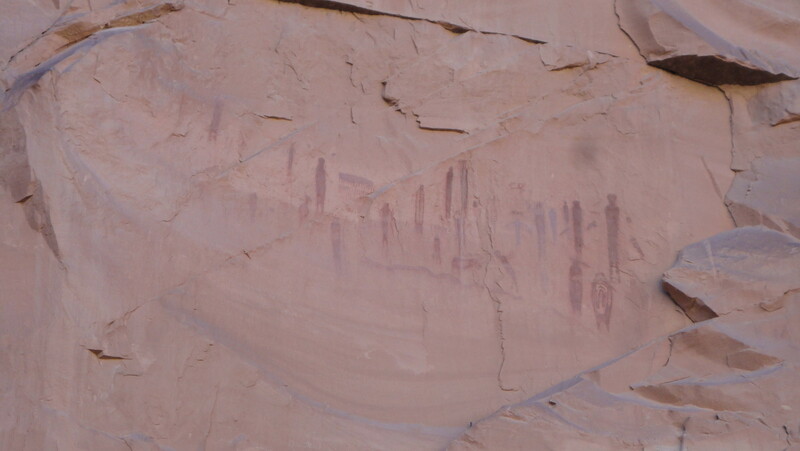 I am sure there are other hiking and exploring options in this canyon and adjacent canyons such as water canyon if time permitted as well as other pictographs in such areas as the Horseshoe Gallery that can be found. View Full Horseshoe Canyon Photo Gallery!